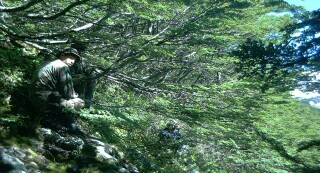 Places of dense, shrubby or bushy as beech forests or coihue of Araucania and Patagonia are virtually impenetrable and can cause unpleasant surprises in the security group if they do not follow certain rules designed to facilitate foot traffic. The breaks or stops grouping should be in comfortable places, that is, less dense vegetation. Typically, the first guide that will be forced to make frequent stops to avoid losing sight of the group, and managed to regroup when necessary. The group must be linked up to the point of not losing sight of the front, but far enough apart not to get hit with the branches of the partner going forward. If for whatever any member of the group is delayed because you have a problem (broken clothes, backpack attachment, loss of equipment, hurts with vegetation, etc.). Must immediately notify the person above, and this advise the guide leads the group to stop the march momentarily to address the problem at hand.